The National Conference on Tuesday resolved that in order to distance government from involvement in religious matters, henceforth, no government, at any level, should use public funds in sponsorship of any religious programme, especially pilgrimages for any category of citizens, including government functionaries. A statement from the secretariat of the Conference said it was also agreed that apex religious bodies in the country be allowed to handle all matters relating to pilgrimage through the Pilgrims Commissions duly managed by them under a law to be passed by the National Assembly to regulate their functions and protect pilgrims. It however agreed that government, in performance of its oversight responsibility to Nigerians, shall provide normal consular services for the pilgrims through the Federal Ministry of Foreign Affairs and the established Nigerian foreign missions in the relevant destinations. In arriving at these decisions, the Conference relied on the recommendations of the Committee on Religion which had Bishop Felix Ajakaiye and Alhaji Nurudeen Lemu as co-chairmen. Twice, during the presentation of the report by Lemu, and against the conference rules of procedure, the hall rose to applaud the committee for its sound analysis, thorough handling and simplification of knotty issues and for coming up with daring recommendations. Conference Deputy Chairman, Professor Bolaji Akinyemi, said the constitution of the Committee on Religion was the most difficult assignment in terms of membership during the inauguration of all the committees. He said this was due to the sensitive nature of the assignment and the fact that “people can change their political views, but they may not change their religious views,” adding that the committee had handled the assignment with diligence and compassion. 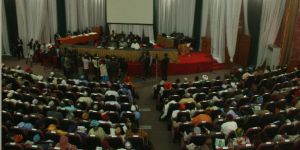 The applause accorded the committee did not however take away opportunity for criticisms by some delegates who said members of the committee had avoided tackling some critical issues and answering questions Nigerians would expect them to answer. Some delegates criticized the committee for its silence on the fate of mission schools which had in the past served as moral training grounds for young people who grew up with such morals for the betterment of the society. Senator Femi Okurunmu accused the committee of shying away from the crucial issue of whether Nigeria is a secular or religious state; explaining that this became necessary because Section 10 of the constitution has been given different interpretations by different people with regard to the secularity of Nigeria. He suggested that Section 10 be amended to make it quite explicit that Nigeria is a secular state so that the misinterpretation can be put to rest. The committee stated that central to the issue of religious harmony in Nigeria was the elimination of religious discriminations and prejudices and went ahead to recommend that Section 10 of the 1999 Constitution should be reaffirmed and upheld in practice. However, while this recommendation was applauded, the Conference was yet to decide on the committee’s suggestion for the establishment of a Religious Equity Commission (REC) with the statutory mandate of advocacy, enforcement of constitutional religious rights such as freedom of religion, freedom to acquire land for religious purposes, among others. Delegates said during clause-by-clause consideration of the report that the National Human Rights Commission should be empowered to handle such issues instead of setting up another commission at a time the issue of devolution of power was being seriously contemplated while another group was against it. The committee had envisaged the REC to serve as a platform that would bring individuals of the major religions in Nigeria to interact and crystalise ideas that would foster unity and tolerance; as well as monitor and investigate and expose cases of religious discrimination and violation. The body was also meant to monitor cases of religious extremism – both in ideology and practice – and formulate counter narratives that are balanced and tolerant to neutralise such extremism. It would have equally served as a watch dog and enforcer of religious rights of all persons, thereby creating confidence and trust in every Nigerian no matter their religious affiliations while also monitoring and investigating cases of hate speeches and utterances meant to incite religious tension and prosecute persons responsible. The committee noted that the restoration of ethics, culture, morals and core values that promote a sense of belonging among individuals and constituent groups within a nation-state was essential to the process of nation building. It drew attention to the complexity and nuances in nation-building, and concluded that religions, being repository of teachings about justice, ethics, morality and humanness could be used as veritable instruments of binding people of different cultures together within a state. The committee disclosed further, “Despite that its peoples are intensely religious, Nigeria is losing the moral compass for nation-building. Many factors contribute to this. There is however evidence from anthropological data that most Nigerian cultures showed greater appreciation of the core values of honesty, justice, ethics, and morality. The Conference, in its deliberation and decision, mandated the National Orientation Agency to put in place a strong advocacy in collaboration with religious institutions to promote core values in the Nigerian society. In a bid to reinvent the African culture of courtesy, politeness, honesty, integrity, communal interdependence and peaceful co-existence which it said were rapidly being eroded in the Nigerian society, the committee suggested that children must be taught their mother tongue or language of their immediate community during the first three years of basic education. In addition, it said learning of Nigerian history should be included in primary and secondary school curricula; while social studies curriculum should be reviewed to reflect Nigeria’s cultural values of respect for elders, hospitality, and communal interdependence, modesty in morals and in dressing. The Conference, in another resolution, said henceforth, hate speeches and sermons meant to create incitement among Nigerians should be criminalised; and those involved prosecuted. Delegates also resolved that profit-making businesses carried out by religious bodies like churches and mosques should pay taxes as a way of contributing to the growth of the economy. Henceforth, by the decision of the Conference on Tuesday, nobody wishing to convert to any religion of his or her choice should be subjected to any form of victimization whatsoever. Based on the recommendation of the committee, Conference resolved that payment of welfare allowances be made by government to men and women particularly the most vulnerable members of the society. It was also agreed and resolved that government should, as a matter of national emergency initiate policies that would accelerate wealth creation for the teeming populace, particularly through creation of jobs.